I've been thinking a lot these past few weeks (since Man of Steel was released, especially) about super powers and the fundamental function they serve in super hero stories. Never mind, for a moment, their basic and most literal manifestation in the mise en scène or the ephemera of whether The Flash is faster than Superman or who would win in a fight between Wonder Woman and She-Hulk. What do super powers in general allow writers to do? It's a deceptively complex question, but I think it's mostly about avoiding death. Super powers, in other words, are the ultimate wish fantasy, and not just the simple wish to be stronger or whatever than the schoolyard bullies but more broadly the collective yearning for immortality. Thus do super heroes endure and protect their fictional citizenries from the most grievous harm. This might be blasphemy but, to a certain extent, I think powers are (or can be) a crutch, an all too easy way out that, in the most egregious of cases, essentially forestalls on the genuine creativity and expressiveness that they're ultimately supposed to enable. (And yes, this includes Batman's "powers" of deduction and invention.) 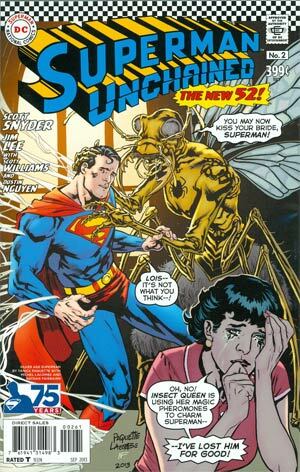 In terms of Superman alone, there's been an ability to merge with walls, super-hypnotism, flying around the earth to turn back time, "repair-o-vision," cellophane S-shields, multiple image projection, and more. In all of those cases, the writers were trying either to be cute or to fill in a plot hole before anyone noticed there was a hole at all. 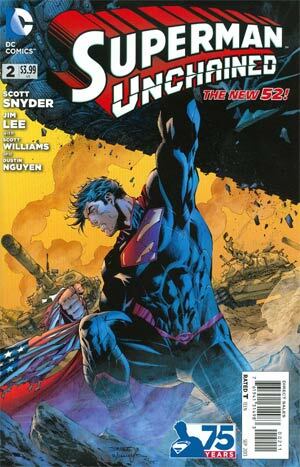 In the hands of a clever writer like Scott Snyder, however, super powers serve their fantastic function without being completely ridiculous. 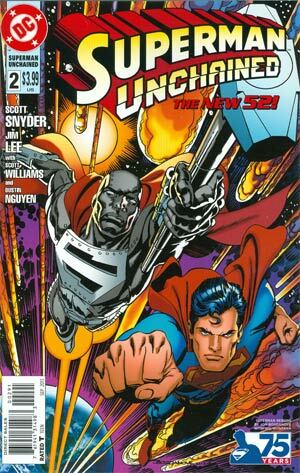 Case in point is the opening scene of Unchained #2, where Supes is faced with the imminent toppling of Dubai's Burj Khalifa, the tallest building in the world, at the hands of terrorist group Ascension, who have hacked the new giant construction robot, the Apollodorus, and set it loose in the city. Perhaps in bygone days when none of us had access to Google and other sources of instant fact- and sense-checking, it would have been enough for Superman simply to push the building straight back up, like Supes does with the Leaning Tower of Pisa in Superman III. Simple as pie, but also technically unfeasible, as Snyder is careful to point out here. Same with the other options he runs down, including flash-heating and freezing the structure to prevent it from snapping, which Supes realizes will only kill occupants near windows. So what does he do instead? Well, he has to think, which is always a nice way to balance the sheer physicality of his power-set. While fighting off the Apollodorus, then, Superman manages to turn the circumstances to his advantage with a little creativity, using a combination of speed, flight and super-breath to create a kind of ice prop that prevents the falling building from falling completely over. Day, saved. What I respect most about this sequence is not the creatively combinational use of the powers but the tacit acknowledgment that the powers themselves are not really what makes this particular hero super. This will always be why Superman is my super hero of first choice, even as I agree that the powers themselves are, you know, cool. The character is determined and infinitely compassionate but willing to make the toughest of choices. But just think about it. 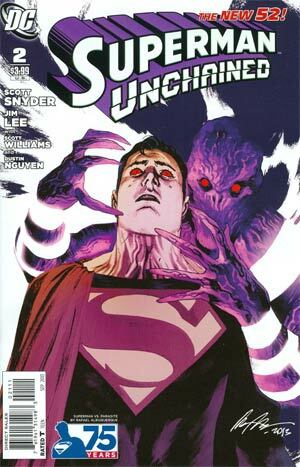 What is being lined up against Superman in this story? A Lex Luthor who is evidently at least as intelligent and accomplished as he's ever been (incarcerated last month in The Maw, he now has a version of his battle suit and is making good his escape); a high-tech hacker group that can evidently out-hack Cyborg and has an intriguing sense of history, in keeping with one of the underlying themes established last issue; a highly distrustful General Sam Lane with unrivaled military technology that can make Superman bleed from his ears, mouth and nose; and a kind of progenitor or quasi-doppelgänger in the form of Wraith who we now know to be technically more powerful than Kal-El of Krypton. Straightforward exertion of body is not going to be how our boy overcomes this. It will help that he has Batman in his corner - or more specifically, if my instinct is right, this newly introduced suit that can actively avoid detection across the full electromagnetic spectrum, which Supes, not Batman, I expect, will end up wearing to gain an advantage over Wraith, who will himself be shown to embody what happens when Superman "goes bad," per the epilogue in which Batman chooses not to destroy the suit at what he imagines would be Superman's own sober insistence. But let me get, finally, to the point. Last month, I had my doubts about this book. Between the gimmicky poster insert, the multifarious variant covers (which, sadly, haven't yet gone away) and an introductory plot that was unexpectedly generic (though masterfully executed), my immediate response to the experience of reading issue #1 was deflation and disappointment, high expectations (too high, maybe) unmet. But I could see great promise beneath the surface, which this issue is now bringing to the fore. 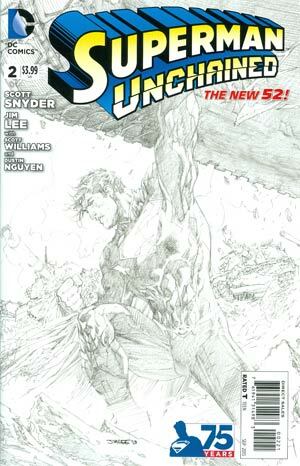 Art - 5: Jim Lee's pencils are, as ever, glorious. There is a casualness about them that, coupled with the expansive detail, simply works. Lee literally makes it look easy. We have Lois Lane getting herself into trouble as usual and the assurance from interviews that she is going to get major page time as the story unfolds, and not just as the object of Superman's protection and salvation. That will be most refreshing, as long as they don't give her powers in order to pull it off. Cover Art - 2: Sadly, because I don't care about variants and my local comic shop knows it, I got stuck this month with a variant I would not have chosen - namely, the one by Nicola Scott and Jason Wright showing Superman and Wonder Woman kissing. My primary complaint is that this image has exactly nothing to do with the story inside the cover, and I'm frankly starting to worry that DC is going to start putting variations of this on everything the way Marvel a couple of years ago was doing with Deadpool. You want to talk about money grabs? 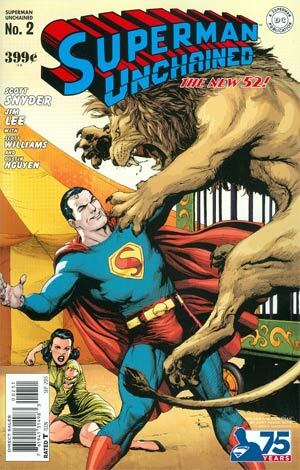 Putting Batman in your supposed Superman movie might qualify, but that's nothing next to variant covers. 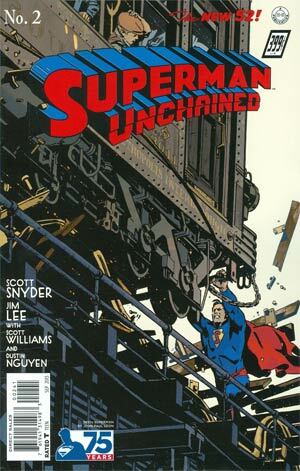 The standard cover of Superman holding up a tank with one hand and a tattered American flag in his other isn't exactly straight from the story, either, but there is at least an altercation with the American military, which arguably tatters itself (and thus, by symbolic extension, the United States and its flag) by taking essentially unprovoked action against our boy. The Superman/Wonder Woman kiss cover also suffers from the awkward pose the two of them are in, which with Superman's feet clearly way up in the air would probably look even more ridiculous if we could see them in their entirety. 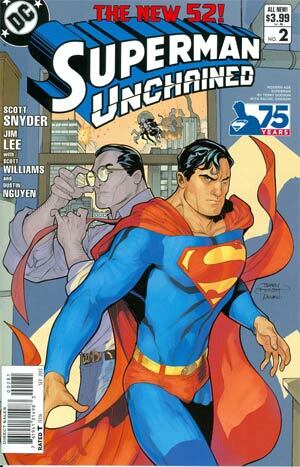 Ultimately, I'm still really not at all clear what exactly is supposed to be "unchained" about Superman in this book. In a first-order sense, the best I can see at this point is that it refers to Wraith, who General Lane calls the "real Superman" in issue #1. But if I know Snyder, higher-order senses are still to be teased and more fully articulated as we proceed. 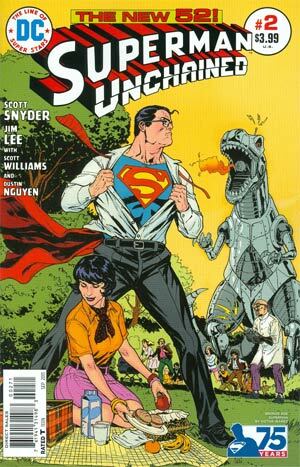 And I haven't been as excited for a Superman comic book adventure since I learned that Grant Morrison would be penning the rebooted Action Comics.